Online betting in India is a bit of a grey area since it isn’t regulated. While horse racing and lotteries are legal to gamble on in many states in the country, sports betting is only legal in the state of Sikkim. Still, Indians living in other states can have a punt – keep reading for the safest place to do so. Online betting in India isn’t regulated. While land-based gambling is mostly illegal, with the exception of lotteries and horse racing, there has been no instances where anyone – operator or punter – has been prosecuted. It is also incredibly popular in the country, with a handful of online betting sites accepting Indian punters. One state in India, Sikkim has legalised online gambling under the Sikkim Online Gaming (Regulation) Act 2008, which includes sports betting. Several other states are looking to follow in the footsteps of Sikkim, but are yet do anything about it. For now, you can stick to the secure sites detailed below for a range of premier betting markets. If you’re after a flutter online make sure it’s at a secure bookmaker where you won’t be ripped off. The following sites are renowned worldwide for the range of sporting options and their superior customer service. The number one bookmaker for Indian punters is Bet365 since it allows players to use Indian Rupees. horse racing, UFC, football, greyhounds , tennis, baseball, basketball, boxing, darts, golf, ice hockey, Formula 1, and more sporting markets to bet on. There’s live streams of special matches including Champions League Twenty20, along with an array of other international cricket events. Bet365 makes wagering easy. Try it on the Bet365 app here. Since you can deposit in INR you might be able to use credit and debit cards – Bet365 accepts Visa and MasterCard – but since gambling isn’t regulated the transaction may be blocked. Neteller and Skrill are both open to Indian punters – you can create an account and fund it using a preferred method to then fund your bookmaker account. Other options available to Indians include AstroPay Card, EntroPay and bank transfers. Another great feature to Bet365 is it features a live chat available 24 hours a day seven days a week, so irrespective of the time zone differences you can still get help. Indian punters will be placing a bet with Betfair International Plc when they wager at this site. It’s important to note this since the terms and conditions are different to those from the Australian, or the UK site. You can find these by clicking Terms and Conditions at the bottom of the website. Betfair plc and Irish-based company, Paddy Power, merged in 2016 and the two brands reach punters in the UK, Ireland, Europe and the rest of the world. It is a betting exchange company, which means you can bet against other punters. They still offer a traditional sportsbook format, but unfortunately, the Indian Rupee isn’t available. There is a variety of other methods available including EUR, USD, AUD, CAD, NOK and more. What you will find is a wide range of sporting markets including the Indian premier league and other cricket markets, with some already available for ICC Cricket World Cup 2019. There’s also horse racing, soccer, basketball and more. Betfair has a 24/7 live chat open for customers with a response rate of around 60 seconds. There’s also an email service which you can use if your issue isn’t as important – response time is around eight hours. Betfair accepts web wallets which is ideal for Indian players, including Neteller, Skrill, and Entropay. Another top bookmaker is UniBet but like Sportsbet, it doesn’t offer the Indian Rupee. It does accept Indian players and you can set your location when you join. There’s a huge number of other available currencies to choose from including USD, EUR, CZK, GBP, CAD, HRK, DKK, EEK, HUF, NOK and more. UniBet is owned by the Kindred Group, which is one of the biggest gambling companies in the world. It has been focused on a multi-brand strategy – including acquiring 32Red Plc the owner of online casino sites 32Red and Roxy Palace. 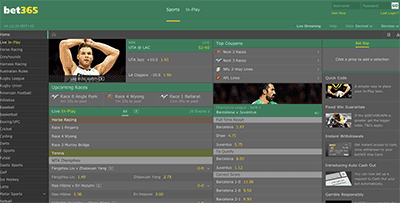 Unibet has a range of cricket, football, tennis, horse racing, basketball, baseball, golf, rugby and more sporting markets available to wager on which you can do on a desktop or mobile device via an app. Get the UniBet app here. A bank transfer is a popular method to deposit with at Unibet, as is Neteller and Skrill web wallets – see more below. We included the apps for iPhones, Androids and other smartphones and tablets in the respective brief reviews above. You can download these to your devices to have a punt on the go. Each online sports bookie is verified by third party jurisdictions to ensure all your personal details, and financial, are secured on any device. The sites have designed the apps to work best for mobile devices so you can tap and bet quickly and easily before a market closes. If you’ve opted for Bet365 you will be depositing and withdrawing in INR and can use the available deposit and withdrawal methods listed below. If you opt for another site and use a different currency it might be best to opt for a web wallet to fund your bookmaker account. This is because web wallets allow you to store funds and transactions are instantly processed. Try Neteller or Skrill as PayPal is unlikely to process gambling payments. Bookmakers have a handy FAQ section so you can follow our links to find out more about banking. One thing we can tell you is all transactions are secured by the latest encryption technology which is the same used by major financial institutions from around the world. We included the contact details of each secure online bookmaker to make things easier for you as a punter. Customer support is important for new and regular bettors. If you have an issue you can contact the representatives at these sites and get verified support as detailed by other punters.